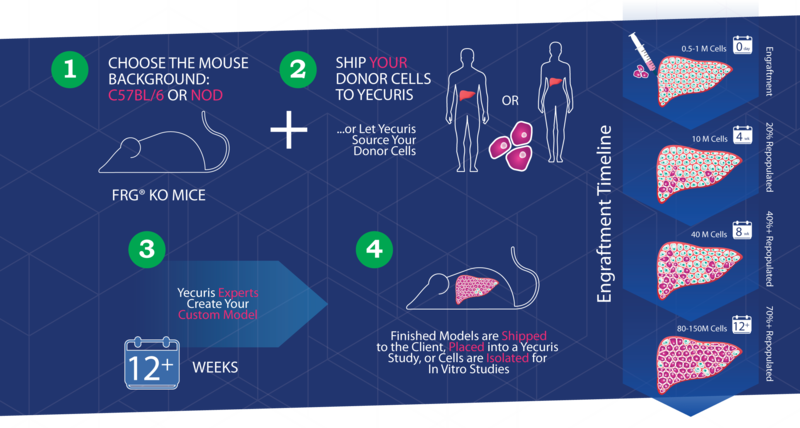 Custom Transplantation | Yecuris FRG: humanized animals and human hepatocytes platform for your next great discovery. Yecuris FRG® KO mice offer a powerful advantage over other humanized mouse models. The platform can be transplanted with cells from any donor or species to yield an infinite number of phenotypic model variants. We’ve worked with hundreds of clients for over a decade to incorporate normal, super, and mutant donors for drug metabolism, NASH, metabolic disease, and infectious disease. Whether you’re looking to bridge data from previous experiments to a human relevant model, or looking to create your own novel model, the FRG® KO platform is the ideal solution. 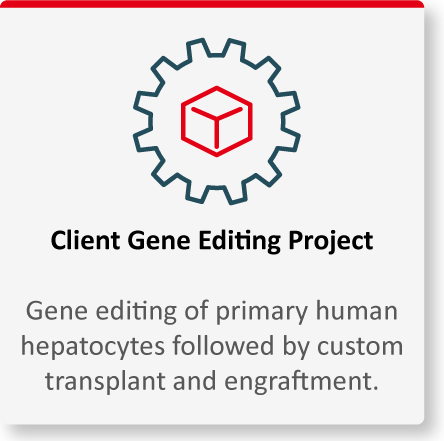 Yecuris offers custom hepatocyte transplantation with any donor that you require, from any species. 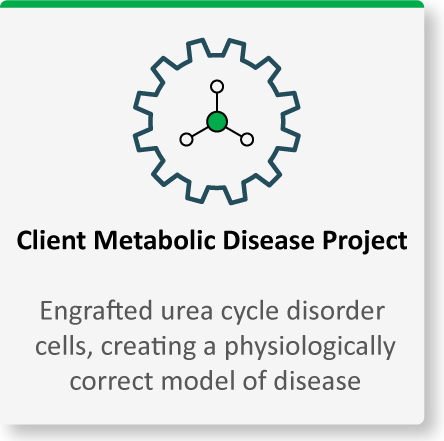 In addition, Yecuris has a selection of phenotypic donors including PNPLA3 and metabolic disease mutants for targeted human relevance. Custom donors are monitored in-house by quantifying human albumin over time as well as survival rates. These metrics are compared to Yecuris internal donors as a reference. Animals are available as murinized or humanized FRG® KO mice, which can be repopulated with our in-house hepatocyte donors or as a custom with your donor of choice. Fully reconstituted animals are dosed with compounds according to study sponsor instructions, and samples are collected for in-process and downstream analysis. Assessment of progression of disease states through the monitoring of body weight, food consumption, glucose, and insulin levels. As the premier platform for In Vivo assessment of gene editing technologies, Yecuris study teams are highly skilled with multiple methods of Ex Vivo and In Vivo gene therapy administration. Looking to use cells isolated from FRG® KO mice for your next In Vitro study? Yecuris models act as bioreactors for hepatocytes with geometric expansion up to 100-fold. We have developed processes for optimal isolation of the propagated hepatocytes with subsequent negative bead-based purification to remove residual mouse cells. Our process yields cell products that are over 98% pure with the ability to be shipped in suspension, plated as fresh, or cryopreserved for future work. For studies that require terminal endpoints, Yecuris can harvest and prepare tissues as formalin fixed, OCT embedded, or flash frozen in liquid nitrogen. Looking for a hard to find donor profile? Let our sourcing experts reach out to their network of tissue providers to locate the optimal donor for your application. Looking for a custom diet? Let us help! Our experts will help you formulate the ideal diet for use in FRG® KO mouse experiments. Used for excretion studies, Yecuris has metabolic caging options available for both cold and hot compound dosing. With over a decade of experience encompassing hundreds of studies across more than a dozen fields, you can depend on Yecuris scientists to work with you to develop well-formulated study strategies to assist you in achieving your critical experimental endpoints. Primary hepatocytes do not expand in traditional cell culture systems. The FRG® KO mouse has been used successfully to geometrically expand cell populations up to 100-fold through each generation of mouse. 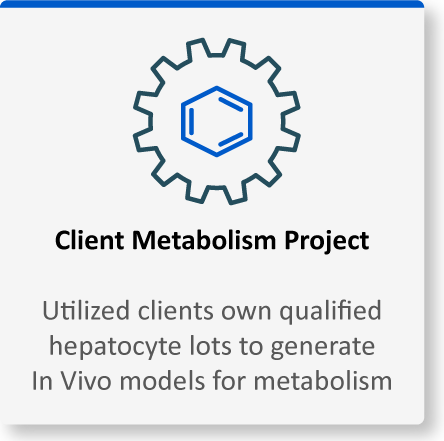 The use of this model system as a hepatocyte bioreactor makes the procurement and expansion of rare cell types feasible for program scale development.